TPE Consulting Engineers have extensive experience in the design and construction in the specialist area of distribution centres for multiple clients. 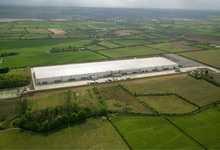 The dry goods distribution centre at Donabate, Dublin which TPE Consulting Engineers completed in 2007 for one of our largest clients Tesco Ireland, is one of the largest in Europe with a building foot print of 70,000m2 (125m x 545m). The original scheme design for the distribution centre was subject to rigorous value engineering exercises to establish the most economic solution at that time. The structural solution chosen was duo-pitch 4-span steel portal frames with structural cladding panels spanning column to column, without the need for secondary steel except around doors and windows. Due to the size of the building two movement joints were provided along the length within the main structure. In addition to the substantial 200,000m3 of cut and fill on the site which included surcharging the land to avoid differential settlements, major infrastructure works included the construction of two new roundabouts, a new watermain, new surface water drainage including a 7000m3 attenuation pond and new foul drainage including a waste water treatment plant. The completed distribution centre has proven pivotal in the day to day distribution of goods for Tesco Ireland to their numerous country wide stores. Further to the success of this build, Tesco Ireland have since employed the services of TPE Consulting Engineers again to complete their other distribution centres.